I think most of us will agree that we’d like our students to keep a record of the lessons we teach in workshop each day. They need something tangible to look back at as they progress through each study. And in a perfect world, they’d want something to take with them at the end of the year, a record of learnings they might use in subsequent years of school. But what form should that record take? I have tried many different forms of note-taking over the years: Cornell Notes, bulleted notes, notes in full sentences, teacher-made notes, student-made notes, class secretary-made notes. Admittedly, some years I told myself that the students would figure it out, would cobble together some iteration of the lesson in their notebooks and be just fine. Other years I’ve taught explicit note-taking techniques and styles. Regardless of what I do, note-taking in workshop has always felt a little awkward to me. Why? Taking notes in workshop is very different from taking notes in science class, for example. In English, the majority of my lessons are skill-based, not content-based. How does one capture the essence of a skill lesson in note form? These are questions that challenge me, especially in my 46 minute classes where I am continually trying to shave minutes off of the lesson to allow for more writing and conferring time. While I do want my students to have a record of notes, time spent taking notes could otherwise be spent writing. With these things in mind, I find that I oscillate between a few different kinds of note-taking systems, which I’ve outlined below. 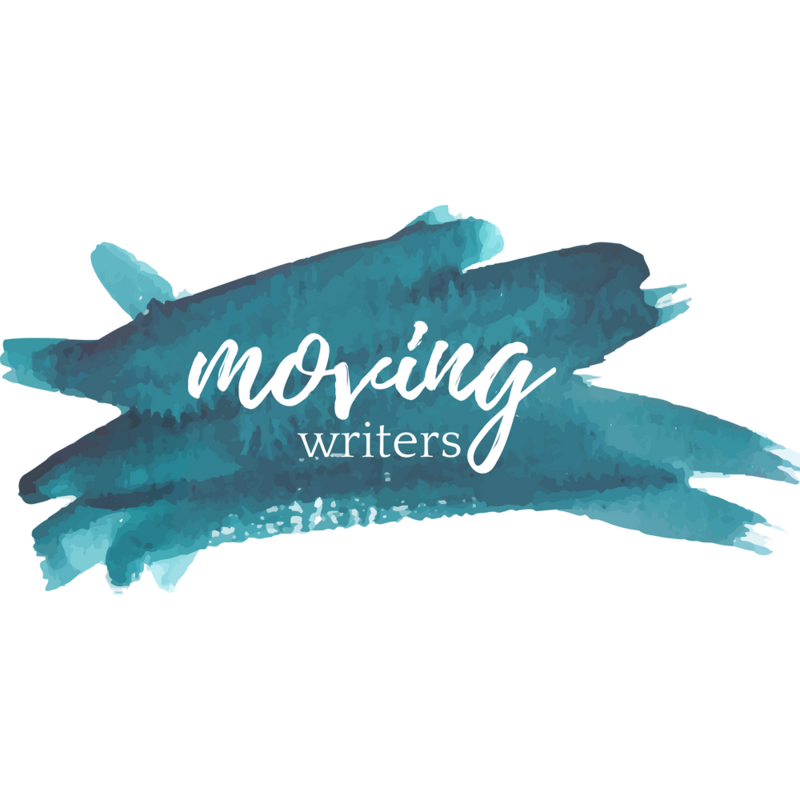 In her book Lessons that Change Writers, Nancy Atwell walks us through dozens of lessons, providing rationales, preparatory notes, during-lesson scripts, and reproducibles. Her reproducibles usually include an overhead of notes that she gives students at the end of each lesson. This overheard summarizes the lesson she has taught and tries to recapture the experience of it. Below are the notes she gives her students at the end of the lesson “Conclusions: End Strongly.” She asks her students to copy these notes into their handbooks before writing time begins. The conclusion often conveys a poems’ deepest meaning. It needs to be strong–to resonate after the reader has finished the poem. The conclusion should leave a reader with a feeling, idea, image, or question. Experiment: try different endings until you find the one that best conveys your meaning. Maybe try an echo structure: repeat significant lines from the lead, or elsewhere in the conclusion. Give your poem the time it needs for the right conclusion. I love Nancy’s handbook summaries because they are filled with voice and offer a kind of sophistication of thought that will challenge students. The disadvantage to giving students handbook summaries, though, is that they may copy them blindly and sloppily, racing to finish. Rather than having to think about what the lesson means to them and how to best summarize it in their own words, they are handed the meaning. However, if the lesson is successful and students fully grasp its meaning by experiencing it, perhaps allowing them to copy pre-written notes isn’t an issue at all? I’ve dubbed any notes that students copy down throughout the lesson as “on-the-go” notes. On-the-go notes can be helpful when giving students simple definitions that you want them to refer back to as you move through the lesson. The downside, however, is that many students are slow to copy notes down, which can sometimes hinder the momentum of the lesson. Simply put, a glue-in is a copy of teacher-made notes that has been printed and cut to fit inside of students’ composition notebooks. Like handbook summaries, glue-ins also remove student accountability and thinking, but they save a lot of time. Here is a recent glue-in I used to teach absolute phrases. At the beginning of any new study, we immerse ourselves in the literature of that study. After one or two days of reading, we are ready to chart our noticings as a group. As students share out, I type these noticings into a Google Document and project them onto the whiteboard. I ask students to copy the noticings along with me, and if they have suggestions or want to combine some of their noticings, we make these changes right in front of one another. Here is a recent list of noticings on good titles in poetry comprised by my eighth grade class. 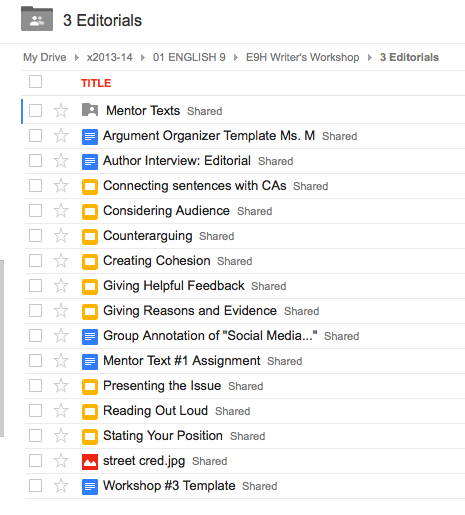 Within each folder, students will find a sub-folder for Mentor Texts and all the mini-lesson materials (they look for the yellow presentation symbol). In addition to the slides I use to facilitate the lesson, they can find any glue-ins, handbook summaries, and links to lists of noticings at the end of each presentation. 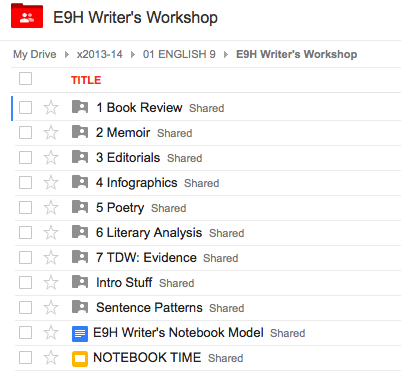 Having this Google Drive back-up system ensures that absent students can find what they need, present students who need reinforcement can check their notes against the class notes, and parents and administrators who want to share in what we’re doing have physical evidence of our journey in writer’s workshop. What role does note-taking play in your workshop? How do you share notes with students? Do you make back-up notes available to all students? We’d love to hear from you in the comments section below — or feel free to tweet us @allisonmarchett @rebekahodell1. I need my students to take notes on the mentor texts they’re reading independently so that they have substantial information for elaboration and support in their own writing on topics of choice. Sketch notes have been an answer to prayer, they just have to be taught ahead of time with specific guidelines. I appreciate the way you have laid out specific note taking strategies designed for the task. I believe in order to make note taking strategy instruction feel comfortable within the workshop, the strategy must be intentionally planned with the end in mind. How will students use these notes? If they do not use them for a meaningful follow up task that drives them to mastery of the learning target, then it is simply an activity – not a strategy for the student tool belt. I too struggle with the awkwardness of notes in Writer’s Workshop. I have tried the gloss over and then work individually method but I feel this takes too much time. This year I have really dug into mentor texts and provided students with hard-copy notes to keep in their Notebooks and refer back to. I just finished a lesson on sentence variety. I gave them the hard copy notes and then designed an activity they had to use the notes for and I think that is the key. Unless they implement the strategy or skill being taught, actively in their writing, it becomes lost. Thanks for the great post and I will aspire to be as organized as you in future years! Thanks for the suggestion about giving notes and designing an activity that requires them to dig in to those notes. I will definitely try this!